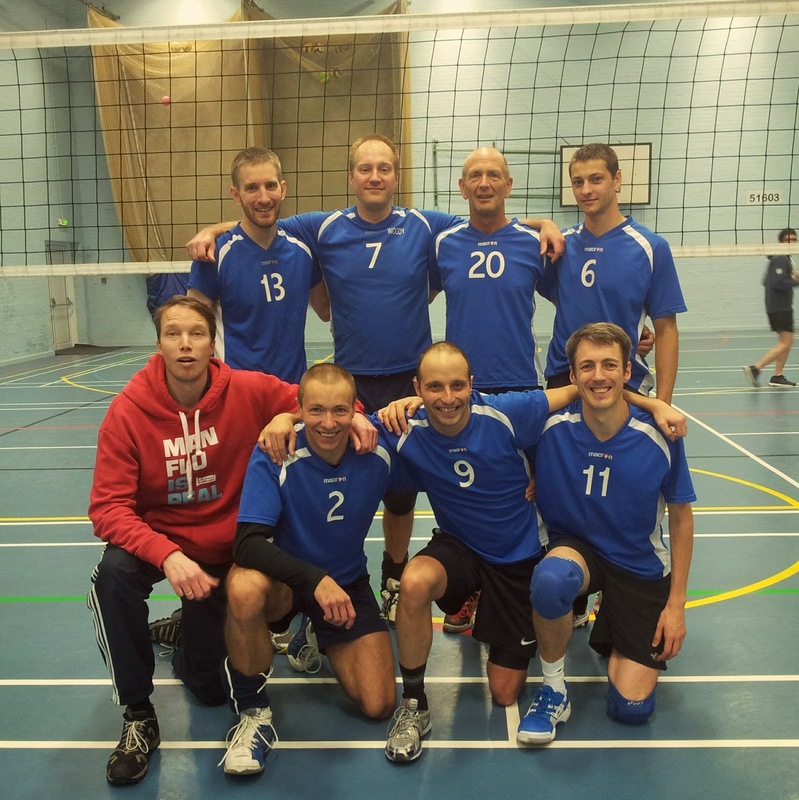 For their first matches of the 2014/15 season Vollox had a case of deja vu - they travelled to Reading to play against Spikeos 2 & Maidenhead, the two teams that they had beaten in a pre-season tournament at the same venue only a few weeks earlier! They were missing key player Martijn Stroo (who picked up an injury in the pre-season games) and setter Jon Williams was late to the action as he was busy guiding the Women's team to victory in the Cup. The absence of Jeremy Wales this season (we hope he's managed to find a team that will take him in Sweden!) is not as noticeable as it might have been, as we've been fortunate enough to happen upon a fine replacement in the form of an American middle, Brad. Other new additions to the squad are Leonard (playing his first match since arriving in Oxford last week) and Adam (a face that we're already familiar with in OVC!). That means the team consisted of: Martijn (coach), Gareth (captain), Jon, Gabri, Leonard, Adam, Rune, Brad. Some miscommunication led to an interesting start to the match... We got under way without much fuss and quickly climbed to a 9-2 lead. It was around this point that we noticed our lineup sheet hadn't been filled in 100% correctly! This led to some confusion about our serve receive positions and hindered us more than anything that came from the other side of the net. We made hard work of the first set - excuses include the aforementioned rotation issue, dodgy refereeing, as well as all-round inconsistent play - but we managed to keep our noses in front (just about) and finished it off 25-23. The second set was a much more relaxed affair as we played in our more familiar system, with our favourite setter! Serving was pretty good with Brad, Gareth, Jon and Rune all going on mini-runs. Coupled with a very consistent sideout (we only failed to sideout once), it led to a very comfortable scoreline of 25-12. MVP: Leonard - congrats to the new boy! Spikeos 2 showed signs of improvement over the course of last season and look like a team that could do well this season. Vollox looked pretty good last year too (and have the trophies to prove it! ), but as one player mentioned, we don't want to end up like the Spanish football team! The first set started very slowly indeed as we allowed Reading to take the initiative and an early lead to 10-6. One or two reassuring timeouts from the coach (Martijn) and we were back on track with a few carefully placed hits and serves. By the end of the set we were back on level terms, and at 20-20 Adam came in to serve for 4 straight points. We then seized our first opportunity to sideout and took the set 25-21. A few stern words from our coach and the reinstatement of our MVP from the previous match saw us make a blistering start to the second set as we raced out 6-0 ahead. Brad applied some more service pressure to extend the lead and from there we looked very comfortable as Spikeos struggled to restore any consistency to their game. Jon (voted MVP) distributed the ball nicely, and our hitters were all quite happy to put it away, giving us the second set 25-13, and the double victory we were hoping for on our first matchday of the new season.